PPPoE vs DHCP may sound like two irrelevant items since the application of each are not the same: DHCP is a protocol for obtaining IP addresses while PPPoE is a common method of connecting to an ISP. But the debate over PPPoE vs DHCP differences has been around for a long time and thus causes a lot confusions. So in this article we will have PPPoE vs DHCP explained and walk you through how they differ from each other. DHCP, or Dynamic Host Configuration Protocol, is a standardized client/server network protocol that dynamically assigns IP addresses and other related configuration information to network devices. It is known that each device from a TCP/IP network should have a unique IP address to access the network. So without DHCP configuration, network admins have to configure IP addresses manually if they want to add new computers or move computers from one subnet to another. Usually, a DHCP architecture is made up of DHCP clients, DHCP servers and DHCP relay agents. DHCP works to offer an automated way to distribute and update IP addresses and other configuration information on a network. A DHCP server provides this information to a DHCP client through the exchange of a series of messages. DHCP enables network users to travel anywhere on the network and automatically receive an IP address when they reconnecting. On the other hand, DHCP provides network admins quicker and more reliable IP address configuration – it mitigates configuration errors caused by manual IP address configuration. DHCP also helps to conserve limited IP address space. PPPoE vs DHCP: What Is PPPoE? PPPoE, short for Point-to-Point Protocol over Ethernet, is an Ethernet encapsulation of the Point to Point Protocol that is commonly used with dial-up connections. 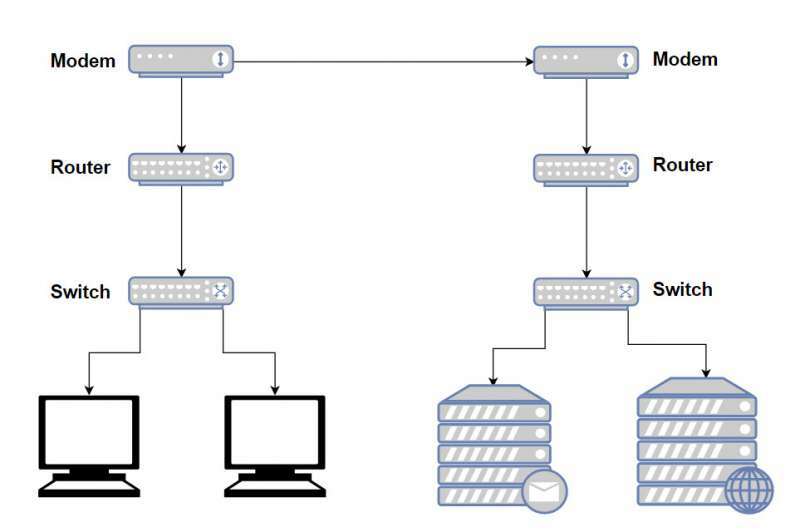 This allows the modem to be a part of the network that multiple users can utilize instead of being connected directly to the computer. 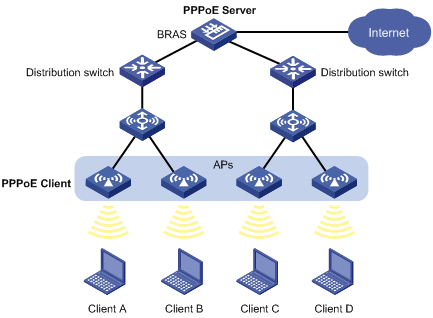 PPPoE combines the Point-to-Point Protocol (PPP), commonly used in dialup connections, with the Ethernet protocol, which supports multiple users in a local area network. The PPP protocol information is encapsulated within an Ethernet frame. To employ PPPoE, you need a username and a password provided by your ISP, which you use to dial-up to your ISP and establish a connection. More recent modems now incorporate the PPPoE dialer into them. You can simply set your username and password once and your modem automatically connects to the internet whenever you turn it on. PPPoE vs DHCP: How They Differ? 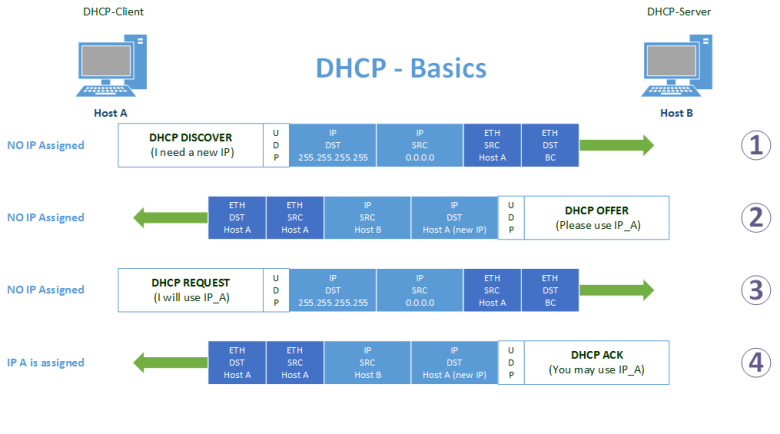 DHCP is a way for a network to allocate unique IP addresses to the devices (i.e. computers, smartphones Gigabit Ethernet switch and etc.) within a network, so that traffic can be delivered back-n-forth without confusion. PPPoE is a way to encapsulate network traffic, based on credentialed access (i.e. username/password). 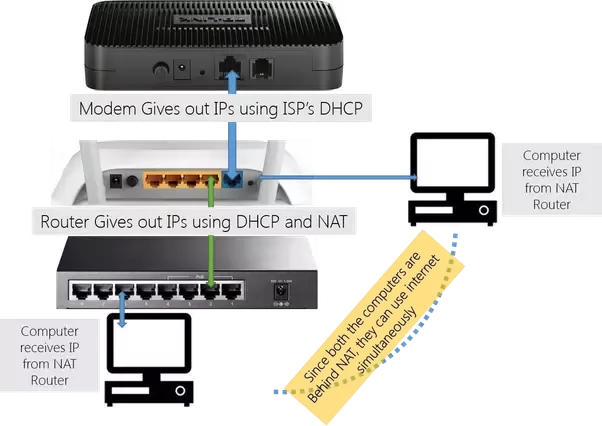 PPPoE needs to be configured correctly before a user can actually connect to the internet, however, modems that use DHCP does not need to be configured and is basically plug and play. So using DHCP to connect to an ISP eliminates the problems that are associated with PPPOE. Just like with computers on a network, you do not need to configure your computer beforehand. You simply leave everything on automatic and leave the configuration to the ISP servers. 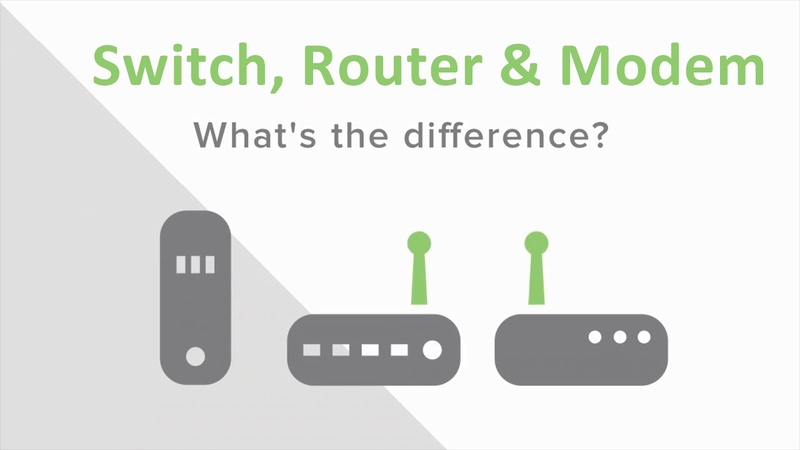 So we’ve explored the definition of each term and major PPPoE vs DHCP differences. It is thus to conclude that there is no “one is better than the other”- PPPoE and DHCP serve two entirely different purpose without overlap. Hope it would help to clear out your confusion. Backed by a professional tech team, FS.COM has improved solutions for network devices like Ethernet routers, fiber switch (i.e. 10 Gigabit switch) and servers. To get any further information, reach us via sales@fs.com. OSPF vs BGP: Which Routing Protocol to Use? This entry was posted in Network Switches and tagged 10 gigabit switch, fiber switch, gigabit ethernet switch, PPPoE vs DHCP, what is pppoe on August 17, 2018 by Aria Zhu. What Is IPv6 and How Does It Matter? IPv6 (Internet Protocol Version 6) is a network layer protocol which allows communication and data transfers to take place over the network. IPv6 came into existence in 1998 and was created out of the concern that demand for IPv4 addresses would exceed availability. IPv6 protocol, which is 128-bits, consists of eight numbered strings, each containing four characters, separated by colon. This gives us an unbelievable amount of unique IP addresses. Despite these, IPv6 protocol also simplifies address assignment (for computers) and provides additional security features. It greatly solves network bottleneck caused by the soaring amount of Internet-connected devices. 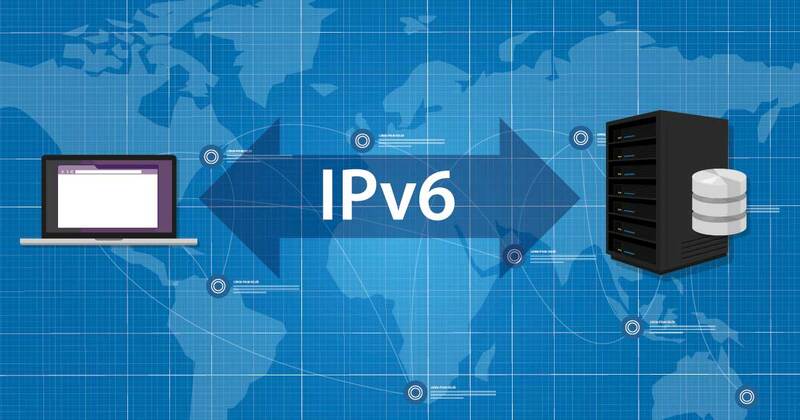 IPv6 protocol is all about future-proofing, with which every current household could have trillions of connected devices, each with their own individual IP addresses, and there would still be plenty of IPv6 addresses to spare, without the need for NAT. Here are the pros and cons of IPv6. Increased Capacity: of address space—resources are efficiently allocated to accommodate additional web addresses. Efficient Routing: allows for easy aggregation of prefixes assigned to IP networks. 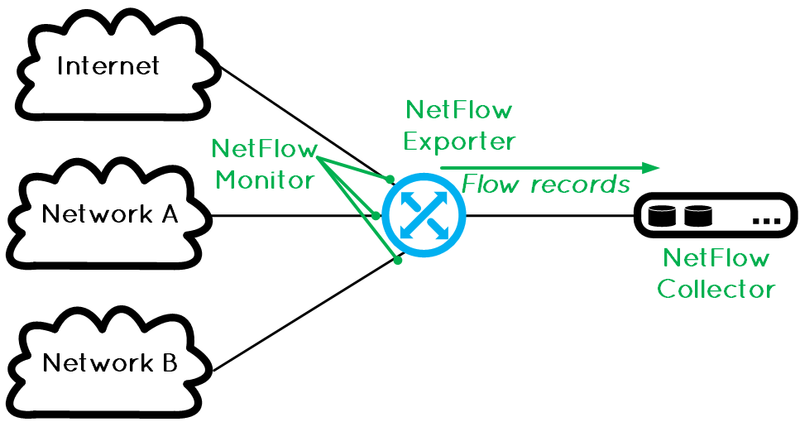 Efficient Data Flow: enables large data packets to be sent simultaneously helping to conserve bandwidth. Security: is improved due in part to improved authentication methods built into network firewalls. Conversion: IPv4 is still widely used and the world is slow to convert to IPv6, the process of making the switch to IPv6 from IPv4 is slow and tedious. Communication: IPv4 and IPv6 machines cannot communicate directly to each other, in the very rare circumstance that they would need to. Readability: Understanding IPv6 subnetting can be difficult on its own, let alone trying to remember/memorize your IPv6 address. 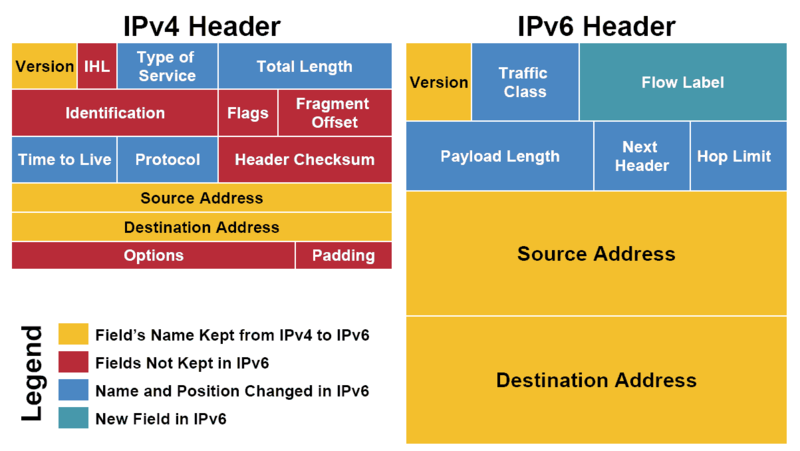 IPv4 vs IPv6: What’s the Difference? IPv4 protocol consists of four number strings – each containing three digits separated by dots. A standard IPv4 address is 32-bit and allows 4.2 billion unique IP addresses. By comparison, IPv6 uses longer IP addresses: with eight groups of four hexadecimal digits, separated by colons. Hence IPv6 significantly expands the pool of IP addresses. Besides, it also frees the internet from relying on NAT because of the dearth of IPv4. Ipv6 enables all devices to be accessible on the public network for easier management. Moreover, IPv6 is much secure than IPv4 at making sure Internet traffic gets to the correct destination without being intercepted. An IPv6-Compatible Operating System: Your operating system’s software must be capable of using IPv6. All modern desktop operating systems should be compatible. A Ethernet Switch/Router With IPv6 Support: Check your network switch/router’s specifications to see if it supports IPv6 if you’re curious. Or when the need occurs, try to grasp network switch/router with IPv6 function. An ISP With IPv6 Enabled:Your Internet service provider must also have IPv6 set up on their end. IPv6 is rolling out steadily, but slowly. As IPv6-only networks can dramatically simplify network operations and keep costs down, there is reason to believe the trend will continue. It’s important to prepare for the future and get IPv6 working, however, there is no need to race to implement this or worrying about it too much. 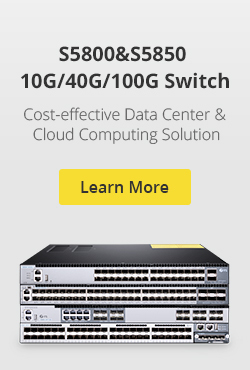 FS.COM offers IPv6 enabled 10GbE switch and other copper/fiber switch with advanced feature sets that can fit your varying demand. For further information, contact us via sales@fs.com. This entry was posted in Network Switches and tagged 10GbE switch, fiber switch, gigabit ethernet switch, ipv4 vs ipv6, what is ipv6 on August 3, 2018 by Aria Zhu. CCTV(Closed-circuit television) uses one or more video cameras to send out video and sometimes audio images to a monitor, group of monitors, or video recorder. The real difference between CCTV and standard TV is the fact that standard TV openly broadcasts signals to the public. CCTV is not openly transmitted to the public. CCTV uses either wireless or wired transmission to send the broadcast from your cameras on the monitor or recorder. Most CCTV systems can be used surveillance, that may include security monitoring, spying, or safety monitoring. CCTV systems have become extremely popular over the past a long time since the technology has improved and be cheaper. Virtually all CCTV cameras being used today are generally for surveillance and security purposes. CCTV systems are available in nearly all bank, casino, mall, and big mall. CCTV systems have grown to be so affordable, most smaller mom and pop stores also have CCTV systems included for security purposes. To install a cctv in your life, you must have a cctv tester to testing the equipment, make sure the CCTV systems can work. Testing is very important to complete the project on agreed deadline and not to overspend or duplicate the work. a. Ensure that the cables you might need to use is right. b. Ensure that the cameras are in the correct location. c. Ensure that you will find a proper reason for entrance externally of the house for the inside. d. Find the best area for the screen and DVR to become stationed. e. Find a sort of large capacity DC voltage because the energy with the CCTV video cameras. f. After all the previous steps have being carried out, a appropriate CCTV security camera tester should be required. The CCTV tester may be the useful gizmo for CCTV system, that is experiencing a leap in technology using digital techniques and also the Internet.CCTV tester can be used for displaying video, controlling PTZ, generating images, capturing data of RS485 and testing LAN cable etc. Its functions, easy operation, and convenient portability enable it simple for that contractor to set up and look after the playback quality camera, promote working efficiency and cost-down the expenditure from the project. .
Fiberstore is a professional fiber optic products supplier, you also can find other optical fibre products ethernet card, fiber switch, fiber optic connectors, etc. 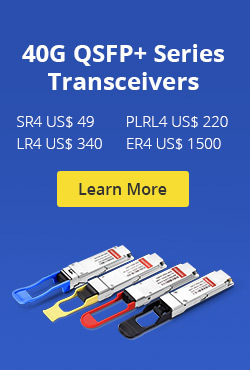 Welcome to our store to choose your fiber optic products. This entry was posted in Fiber Optic Testers and tagged cctv tester, ethernet card, fiber optic connectors, fiber switch on May 14, 2013 by Amelia.Liu.